River Valley High School gladly accepted their new tree this fall. Pictured from left: Bill Holcomb and Matt Huck of River Valley, Buz Call, Richard Brown, and Rick Howell of the Gallipolis Lions Club. 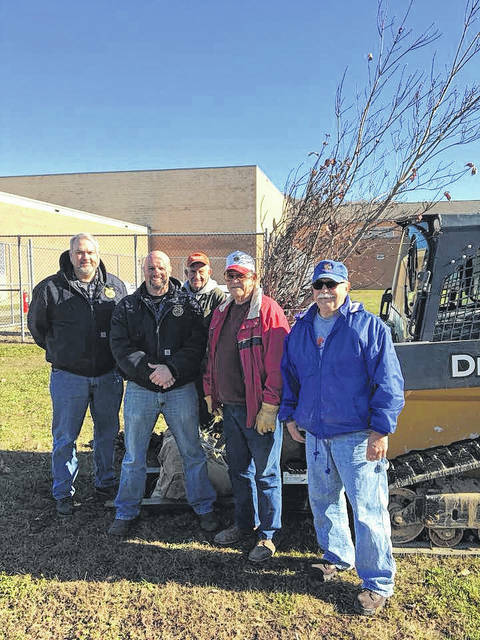 GALLIA COUNTY — Gallipolis Lions Club is donating 18 trees to high schools in Gallia County. What started as an environmental service project last year is at last taking shape at River Valley, South Gallia, and Gallia Academy High Schools with each school receiving six trees over three years. Howell also explained each school was given the chance to choose what species of tree it wanted planted on its grounds. South Gallia opted for Cherry trees, River Valley went with White Dogwood trees and Gallia Academy selected Red Maple trees. The entire project is funded by the Lions Club as an opportunity to fill needs and give back to the community. According to Howell, Josh Donley, principal of GAHS, voiced that he felt the school needed more surrounding trees. “It adds to the aesthetic of the school. Think about it, we have three brand new schools,” said Howell. At South Gallia and River Valley, the Future Farmers of America and agricultural studies programs helped plant the trees at their respective schools. Thinking of the future, Howell’s hope for this project is to support local education and the environment.